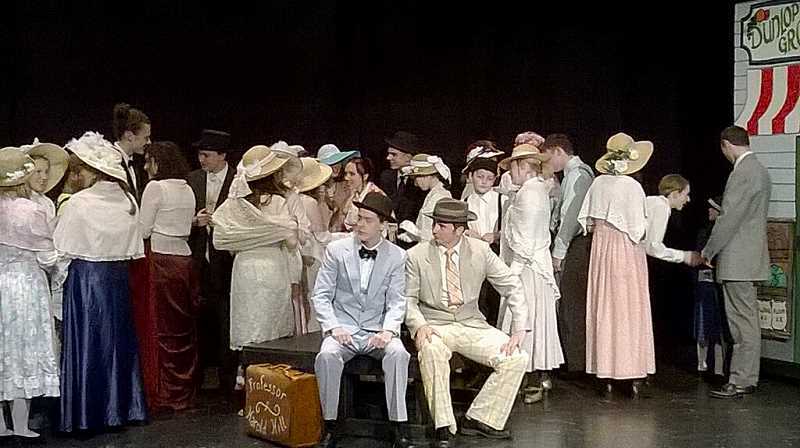 Be prepared to be completely charmed by the Colton High School Drama Club's production of "The Music Man." The cast has worked hard and it shows in flawless musical numbers, perfectly choreographed dance numbers and strong acting. 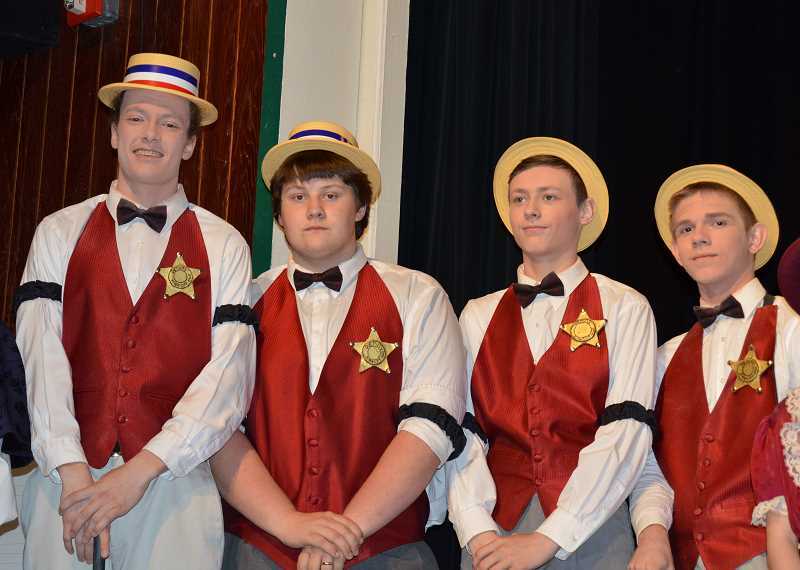 The sets and costumes created by parents and students add to the "this is as good as any Broadway show I have seen" comment (The backstage crew gives a shout-out to the Molalla High School band department for lending band uniforms for the play). "This is the best chorus I have heard in a very long time," local musician Don Newell said at intermission. "I can't believe how good the barber shop quartet is," play attendee Ruth Nimrod said. "We didn't know anything about barbershop music," Boon Bigonovich, barbershop quartet member, said," It isn't what I listen to, but it is really fun to sing." The story of "The Music Man," was first produced on Broadway in 1957. In it musical con artist Professor Harold Hill, (played to perfection, in the CHS production by Nick Davenport), poses as a band organizer prepared to "save the town." Harold even sells non-existent instruments and uniforms to the town's children. All goes according to Hill's plan until he becomes enamored with the town's librarian and piano teacher, Marian Paroo, played by Jalen Liles (first week) and Morgan Ackerman (second week). "It is such an honor to work with these outstanding students with wonderful talent," director, Allan Bruner said. 'They have such a desire to do a great job and put in the effort and you can see it in their performances." You can catch the show this week on Thursday, Friday and Saturday ( May 18-20) doors opening at 7 p.m. and curtain time at 7:30 p.m. and a Sunday, May 21, matinee with doors open at 2 p.m. and curtain at 2:30 p.m. Prices for tickets are adults-$7, students-$5, seniors-$4 and a family rate of $15. The Imani Milele Choir will perform for the students and local community on Thursday, May 25. Students at Colton Elementary will see the choir perform at a school assembly during the school day. The group will tperform for the community at Colton High School at 7 p.m. There is no entrance cost but they will be set up for donations as well as merchandise they have made and brought from Uganda. People will be encouraged to donate. There is no entrance cost but they will be set up for donations as well as merchandise they have made and brought from Uganda. People will be encouraged to donate. Imani Milele webpage says, "We are a Christian organization on a mission to rescue, educate, develop, and improve lives of Uganda's orphaned and most vulnerable children. We overcome the obstacles in their path by equipping them with the necessary skills to become productive and self-sustaining leaders in society. The choir boasts of an incredible cast of fresh, raw talent of boys and girls - all beneficiaries of Imani Milele Children from all around Uganda, who are identified, handpicked, and trained for more than a year to develop into an amazing young ensemble." The annual auction hosted by the volunteers of the Colton Rural Fire Protection District #70 is this Saturday May 20 under the big tent in the lot behind the main station, 20987 South Highway 211. The auction will begin at 10 a.m.
Beginning at 7 a.m. the volunteer will be serving breakfast, which is by donation only and they will be serving a $3 lunch beginning around 11:30 a.m. There will be a silent auction and a garage sale type event inside the blue building. According to Colton Volunteer Firefighters Association president, Joyce Veelle, most of the money raised during the event will be donated back to the community in many forms from scholarship money to donations to the school and community projects.